Summer Road Trip! Next Stop Petoskey State Park! After our "ding dong ditch" trip to Chillermania, we enjoyed a short scenic ride to Petoskey, Michigan. We saw vineyards, fields of hops, and fields of sunflowers along the way. Not to mention a plethora of lakes, small towns, and beautiful homes. I would have loved to stop and taken a stroll through some of the towns and in Petoskey especially, but the natives are just not at the age to appreciate such things, so it was off to Petoskey State Park for our next stop! Petoskey State Park, located on the north end of Little Traverse Bay, is situated on 303 scenic acres and offers a beautiful sandy beach on the bay. The park has two separate modern campgrounds. Tannery Creek offers 98 campsites, and Dunes offers 70 campsites. 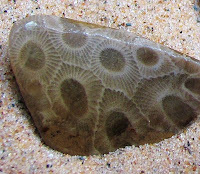 I explained to Jackson what Petoskey Stones were and we went on the hunt. This is a great beach to scour for fossils, rocks, sand glass, and coral. We found so many treasures! I was glad I thought ahead to bring buckets! Some of the beach is splashed with smooth stones - perfect place to find treasures! Jackson found two Petoskey Stones and was thrilled! After our rock hunt we decided to jump off of some of the dunes at the beach! Fall is on its way!! For safety purposes, high visibility Safety vest and Reflective tape are going to make you far more visible. Friday night Fun or Horror??? Summer Road Trip - First Stop: Chillermania!! Like a G6... I Flew an Airplane!!! I Am a Ghost Hunter!! The First Real Day of School! My Junk - Your Treasure??? Hallelujah! The First Day of School!! !